The review notes that, ‘Following Boys’ lead, we might indeed argue that contemporary debates within US foreign policy can usefully be studied through the lens of the Clinton years.’ This is, indeed, the focus of my continuing work and will be adopted in my forthcoming publication, Clinton’s War on Terror to be released by Lynne Rienner in 2018. Right, it’s been a turbulent few months (if not a whole year, frankly), with many highs and some awful lows, but hopefully things are back on track here at JDB HQ. The sun is shining, the birds are in the trees and the sky is blue. I’m delighted to announce that my latest academic article, ‘The Presidential Manipulation of Inherited Wars of Choice: Barack Obama’s Use of Nixonian Methods as Commander in Chief,’ will finally be published in the October edition (42/3) of Congress and the Presidency. Even more importantly, I have signed a book contract that will continue my research into the Clinton administration. Building upon the recent success of Clinton’s Grand Strategy, I will be developing Clinton’s War on Terror for Lynne Rienner Publications, with an anticipated publication date of 2018. I will be bringing more details of these and other projects to this web site as soon as they develop in the coming weeks and months, so stay tuned! Later today, the worst kept secret in US politics will be unveiled: Hillary Rodham Clinton, former First Lady, former Senator, former Secretary of State, will once more seek the Democratic Party’s nomination to be President of the United States. She has been here before, of course. In 2007 she was most peoples’ expected nominee and therefore, choice to be president. Who had ever heard of this upstart from Chicago? Barack who? Never heard of him…. Hillary’s opportunity in 2015 is to present the 2016 election as an opportunity to do for gender politics what Obama did for racial politics in 2008. She must make this about an opportunity to elect the first women president, not the third Bush president. In doing so, it will be fascinating to see how Hillary presents herself to the electorate. In previous campaigns she has sought to outdo her male colleagues in terms of appearance and posture: All pantsuits and policy. There are signs this may be changing. Her appearance has altered in recent weeks, and her family are currently gracing the covers of Elle and Town and Country. This is no coincidence. If Hillary campaigns as a woman, not as a politician, it will be fascinating to see if this makes her more accessible to the electorate, which was always her biggest challenge. She has the brains, but her husband has all the charm. She needs to channel as much of this as possible over the next 18 months. Hillary’s challenge will be to overcome the mistakes of her last campaign. She was caught flat-footed by Obama’s early candidacy and by his reputation for generating a fortune from grassroots supporters (notwithstanding the far larger fortune he quietly secured from corporate America). She is clearly seeking to get out the traps early and hit the ground running in Iowa, where she will file her papers shortly. However, she must not rely upon last cycle’s technology to win next year’s election. The suggestion that she will announce her candidacy on-line, in a tweet and perhaps a video plays into the hands of those who portray her as aloof, removed from the electorate and far too much of a presumptive nominee. Retail politics is king in the primaries. If she is perceived as being the electronic candidate she will struggle and provide an opportunity for a home-grown, done-to-earth, flesh and blood candidate to emerge and inflict grave damage on her campaign. A little like happened in 1992 with a smooth, charming, ah-shucks governor from Arkansas. Who’d have thought it? Indeed the contrast with her husband’s run in 1992 is striking. As I detail in Clinton’s Grand Strategy, Bill Clinton didn’t announce his campaign until October 1991, only a matter of months before the first votes were cast in Iowa and New Hampshire. Now, his wife is announcing her candidacy in the sun and the spring of 2015, 10 months before the polls open in the snow and ice of Iowa and New Hampshire. Hillary’s announcement, the Tweet that Will be Heard Around The World, is her last, best shot at securing a real place in history in her own right. Not as her husbands’ wife, not as a junior senator from New York, not as Obama’s Secretary of State, but as the first Woman President of the United States. That must surely be her place in the lexicon of American politics and the journey to that auspicious place in history begins anew today…. I have conducted a series of interviews to mark the imminent release of Clinton’s Grand Strategy that you may find of interest. Clinton’s Grand Strategy: U.S. Foreign Policy in a Post-Cold War World is now available in the UK and will be released in April in the United States. It is available simultaneously in hardback, paperback and electronic formats and can be ordered NOW on Amazon.co.uk and Amazon.com. I will be attending a series of events to mark the release and will be happy to provide signed copies upon request. President Clinton’s time in office coincided with historic global events following the end of the Cold War. The collapse of Communism called for a new US Grand Strategy to address the emerging geopolitical era that brought upheavals in Somalia and the Balkans, economic challenges in Mexico and Europe and the emergence of new entities such as the EU, NAFTA and the WTO. Clinton’s handling of these events was crucial to the development of world politics at the dawn of the twenty-first century. Only by understanding Clinton’s efforts to address the challenges of the post-Cold War era can we understand the strategies of his immediate successors, George W. Bush and Barack Obama, both of whom inherited and continued Clinton-era policies and practices. James D. Boys sheds new light on the evolution and execution of US Grand Strategy from 1993 to 2001. He explores the manner in which policy was devised and examines the actors responsible for its development, including Bill Clinton, Anthony Lake, Samuel Berger, Warren Christopher, Madeleine Albright and Richard Holbrooke. He examines the core components of the strategy (National Security, Prosperity Promotion and Democracy Promotion) and how they were implemented, revealing a hitherto unexplored continuity from campaign trail to the White House. Covering the entire duration of Clinton’s presidential odyssey, from his 1991 Announcement Speech to his final day in office, the book draws extensively on newly declassified primary materials and interviews by the author with key members of the Clinton administration to reveal for the first time the development and implementation of US Grand Strategy from deep within the West Wing of the Clinton White House. Bloomsbury is a leading global publisher with offices in London, Sydney, New York, Doha and New Delhi. Bloomsbury is home to Harry Potter, Jay McInerney and the Churchill Archive. In 2013 the Academic & Professional Division was awarded two Independent Publishers Guild awards: Independent Publisher of the Year and Academic & Professional Publisher of the Year. The division was also shortlisted for two Bookseller Industry Awards: Academic, Educational & Professional Publisher of the Year and Digital Strategy of the Year. I am delighted to announce that I have signed a book contract that will see my research into the Clinton Administration’s Grand Strategy published by Bloomsbury. The book will be available simultaneously in hardback, paperback and electronically and will be listed for pre-order on Amazon in the coming months, with publication anticipated for Christmas 2014. Examining the policy making process and the implications that theses decisions had on the global stage, Clinton’s Grand Strategy: U.S. Foreign Policy in a Post-Cold War World will draw on interviews with leading members of the former Clinton National Security Council and his foreign policy team. 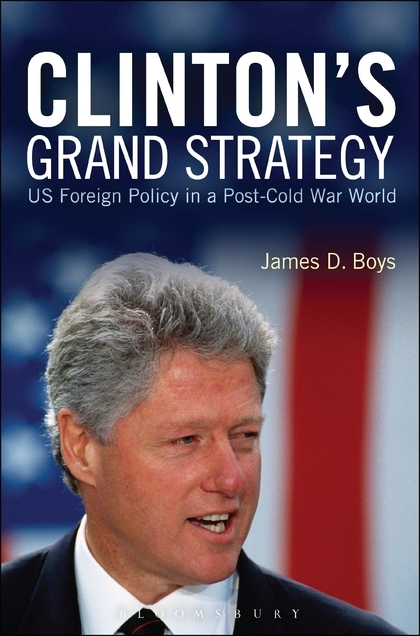 The book examines the evolution and execution of U.S. Grand Strategy during the Clinton Administration (1993-2001), exploring the manner in which policy was devised, the characters responsible for its development, the philosophical and political factors that shaped it and the way in which the policy was implemented. Clinton’s Grand Strategy was designed to address the world in the aftermath of the Cold War and the book will cover the dramatic events that affected its implementation. The manner in which these events shaped or hindered policy implementation will be considered in detail, as will tensions that existed between the abstract task of developing policy and the challenges of implementation in a constantly evolving world system. Drawing on materials and interviews with those who knew and worked in the administration, this book places Clinton’s Grand Strategy in sharp relief, detailing the evolution of the president and his administration from their early days in office as they sought to come to terms with the power at their disposal, through their two terms in the White House as they attempted to implement their grand design.